Well folks, it’s been a while. And I’m sorry to say that my New Year’s resolution of being more consistent with my blogging has not worked out as planned. I’ve just been super busy with work, two out of town half marathons, and a trip to Washington, DC (for work). 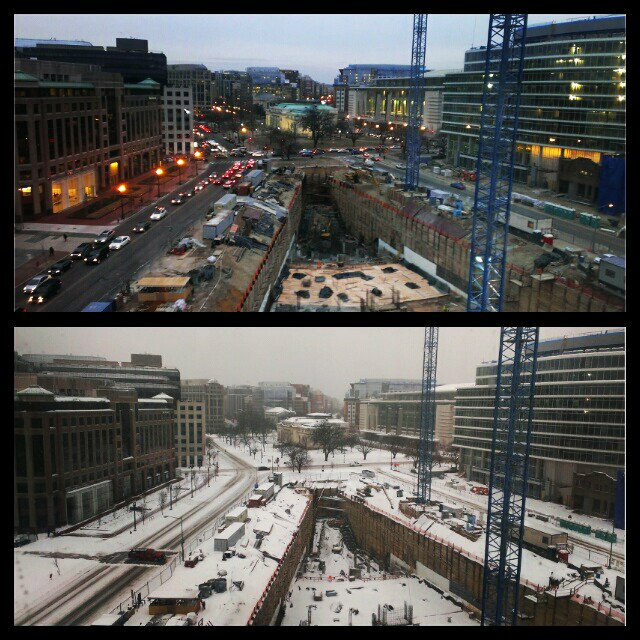 Oh yeah, and getting stuck in DC thanks to Winter Storm Pax. Anyway, things appear to be calming down a bit in my life so I’m going to take advantage of that and try to get back on track with writing posts! 🙂 I’ve really missed it! 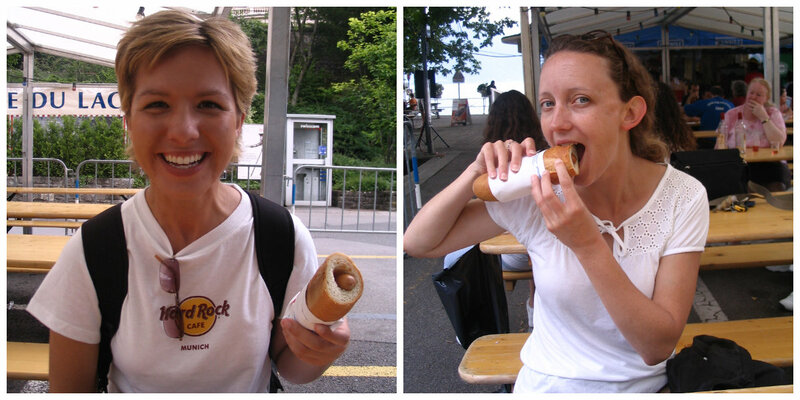 In honor of the Winter Olympics, I thought I would share some more about my time in Switzerland during my 2007 summer in Europe. Switzerland is, after all, home of the International Olympic Committee. After spending two nights sleeping in a barn in the Swiss alps with my friend, Teresa, we took a train from Interlaken to Lausanne, which is situated on Lake Geneva. Lausanne is built on three hills, is located in the French-speaking part of Switzerland, and is considered the Olympic Capital. It’s also such a picturesque city! My first view of Lake Geneva was from the train: as we exited a tunnel, there it was – huge and sparkling, its shores lined with small towns and vineyards. I was so excited and looking forward to spending time there! Once in Lausanne, our first line of business was to find Lausanne Guesthouse & Backpacker, our accommodations for the next three nights. I’ll share more about this hostel at the end of this post, but let me just say that it was one of the nicest ones we stayed at during our ten weeks traveling through Europe! After checking in, settling in, and taking much needed showers (remember, we had just spent three days in a barn), we headed back out feeling wonderfully refreshed! 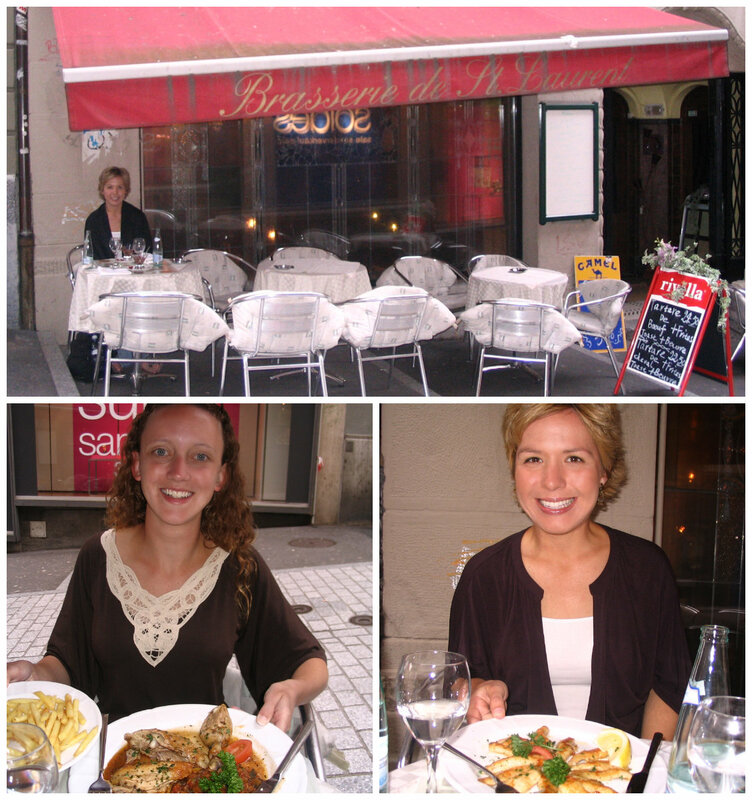 We settled on a cafe called Brasserie de St. Laurent, our decision based on the fact that it was one of the first restaurants we came to that had decent prices. 🙂 We both ordered a plat du jour and I enjoyed a salad, fillet of perch, french fries, and chocolate mousse for dessert – all for 18 Swiss francs! Can’t beat that! I realize that the top photo makes this place look a bit sketchy but we honestly didn’t even notice! We enjoyed eating our meal outside and I completely felt like I was in France. Being here got me so excited about visiting Paris in a few weeks! After dinner we stopped by a grocery store to pick up some food for the next few days, then headed back to our hostel where we were looking forward to enjoying a really good, long night of sleep in real beds! The next day we had a leisurely morning, sleeping in and eating breakfast in our room, then making our way to Ouchy, Lausanne’s waterfront. We toured the Olympic Museum located there and were so inspired by the many exhibits and films we saw! I had goosebumps covering my body nearly the entire time we were there! We saw all of the Olympic torches and medals used in the modern Olympic games as well as artifacts from the ancient Greek Olympics. Photos were not allowed inside the museum but they were certainly allowed outside in the Olympic Park and we took full advantage! We picked up lunch from a bakery and walked down to the lakeshore to eat. When we first arrived at the lakefront we noticed that there appeared to be some kind of festival going on as the place was hopping! There were bands playing, vendors selling food, street performers, and various races going on (running and rowing). It was a very fun atmosphere! As we sat on a bench eating our food and watching the crew races on the lake, we decided we could give them a run for their money. So we hopped on a paddleboat (free this day because of the festival) and took off! And by “took off” I really mean paddling at about a snail’s pace. But it was still fun! And you couldn’t ask for a more beautiful setting: huge lake with the alps on one side, a lush, beautiful city on the other, and a perfectly blue sky above. We were on the lake for about an hour and then paddled back to shore. Time to hike back up to our hostel, stopping along the way to do some souvenir shopping. 🙂 Back in our room we packed a picnic lunch then headed out again to a park that had free wifi. 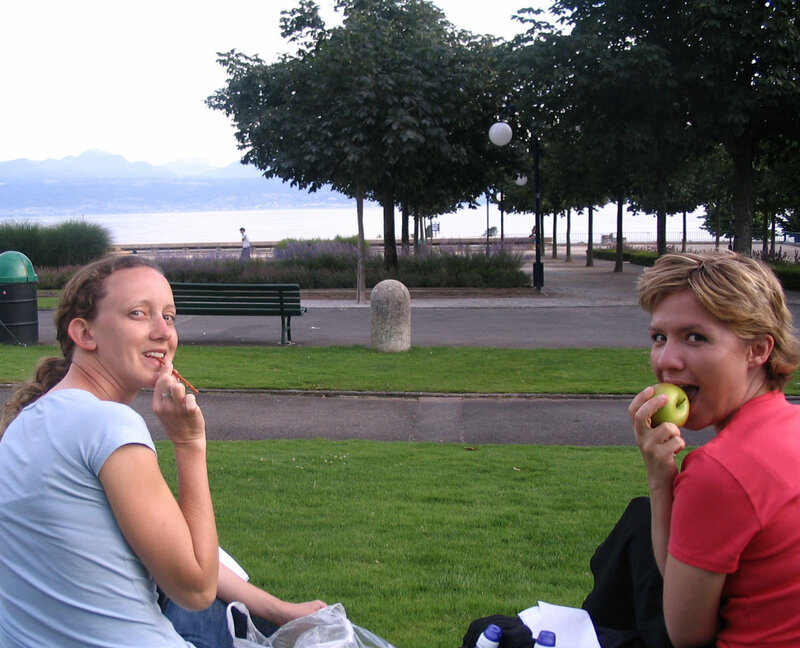 After staking out a spot on the grass with a grand view of Lake Geneva and the alps, we ate our dinner and caught up on emails as the sun set. What a beautiful evening! We spent over two hours there then headed back to our hostel for the night (such late night party animals, aren’t we? 😉 ). The following morning we picked up some pastries for breakfast then hopped on a train for a short trip to Montreux, located 25 minutes away on the shores of Lake Geneva. Can I just say that I could so live on Lake Geneva? During the summer, that is. 😉 It’s just so beautiful! 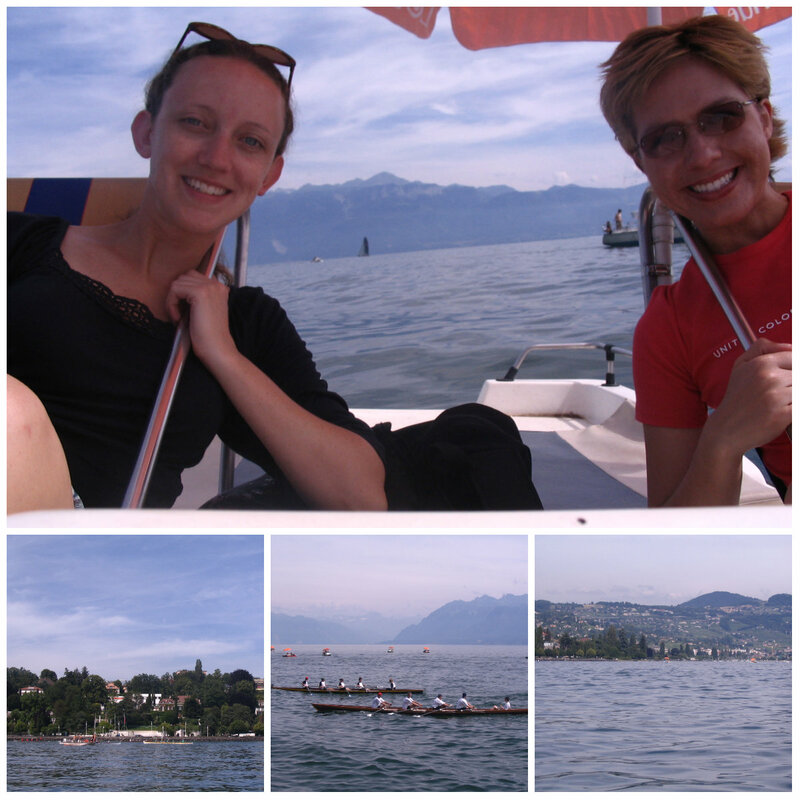 Once in Montreux, we started walking along the lake toward the Château de Chillon. We couldn’t have asked for a more lovely walk along the lakeshore promenade lined with shady trees and colorful flowers! 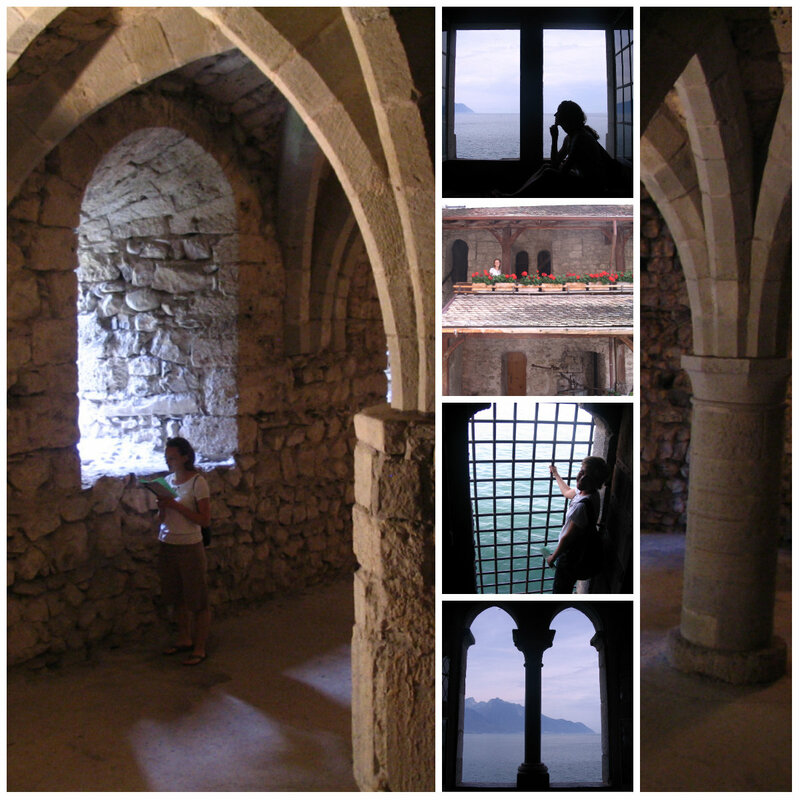 The Château de Chillon is an island castle dating back to the 12th century. It has inspired many artists and writers including Rousseau, Victor Hugo, Lord Byron (who carved his name on a pillar in the dungeon) and Delacroix. I really enjoyed walking through this place that combines the darkness of medieval times with the beautiful scenery and quaint, flower-filled courtyards. So many of the rooms have huge windows over-looking the lake from which you could sit for hours watching boats go by. On our walk back to the train station we stopped for lunch at a little area by the lake where food vendors had set up tents and jazz music was playing. It was so great! I could have sat there all day! After finishing our hot dogs and french fries (have I mentioned before that this trip occurred years before my healthy eating habits? ), we raced to the train station as dark clouds were starting to roll in. By the time we made it back to Lausanne, the rain was coming down so we headed back to our hostel for the evening. While in Lausanne we stayed at the Lausanne Guesthouse & Backpacker – a lovely, clean, quiet hostel located near the train station. 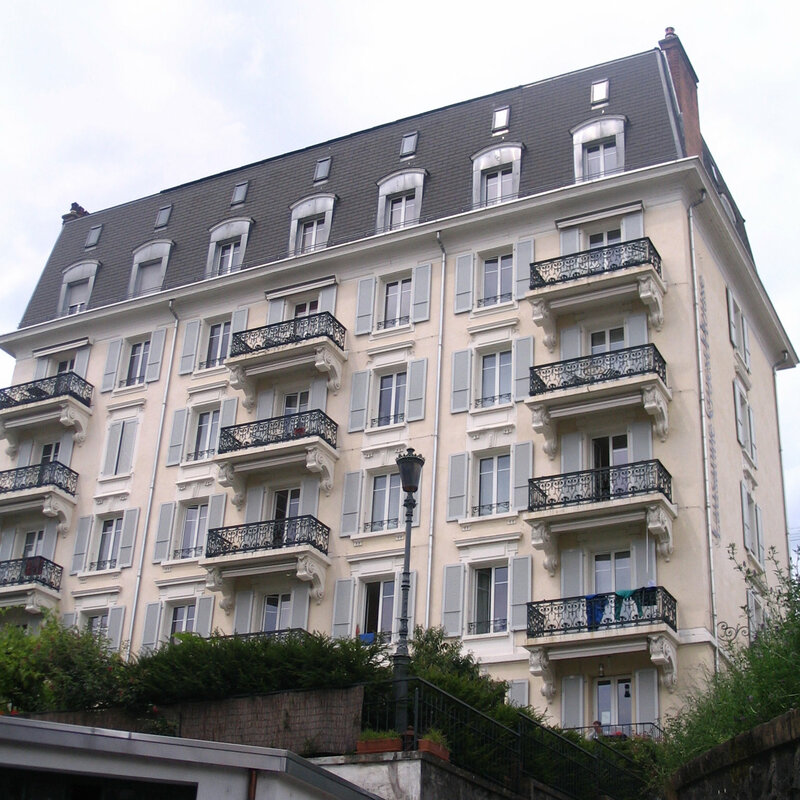 We stayed in a 4-bed dorm but they also have private rooms and family rooms, and many rooms have balconies and views of Lake Geneva. The hostel is located “halfway” up the city – perfect for exploring. Current rates for a dorm bed are CHF 34.90. They do not provide breakfast but do have a fully-equipped kitchen for guests to use. What they do provide is free WiFi, a lovely garden, and private parking. 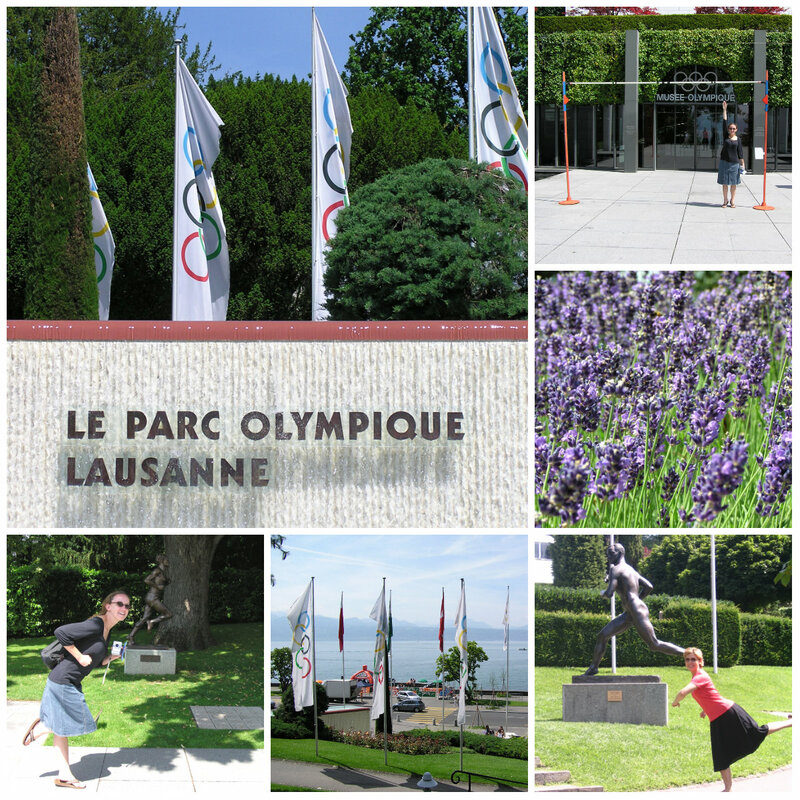 Current rates to visit the Olympic Museum in Lausanne are CHF 18 for adults. 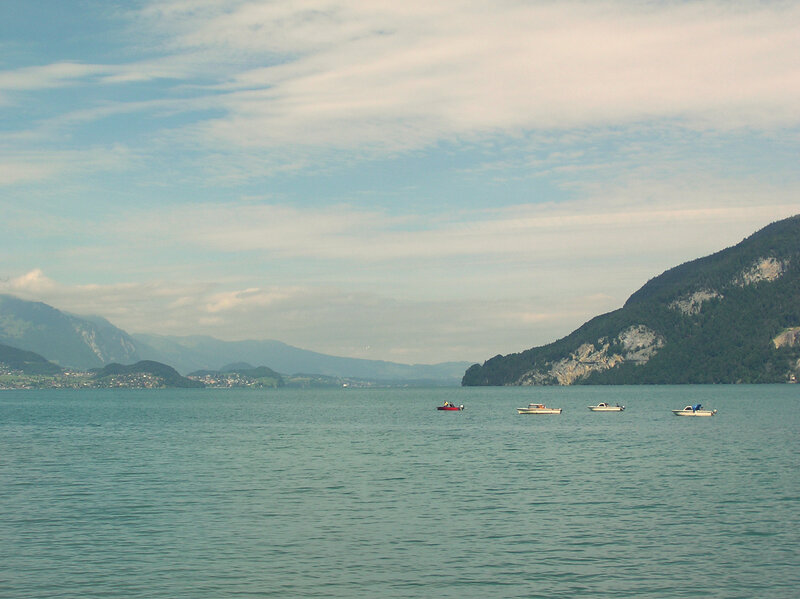 Montreux is a lovely day trip from Lausanne. Along with the Chateau (current entrance rates are CHF 12.50) and beautiful walks along Lake Geneva, they also host the annual Montreux Jazz Festival every July – on my bucket list!